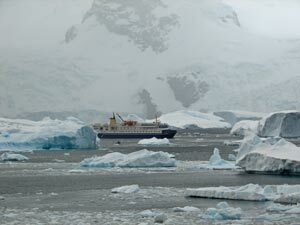 Overnight the Ocean Nova had crossed Bransfield Strait to reach the shelter of Mikkelsen Harbour on the south side of Trinity Island. 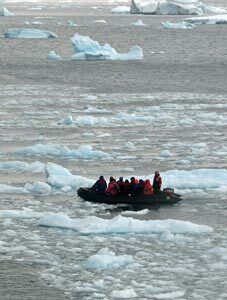 It was pleasant sleeping on a still vessel in the early morning. 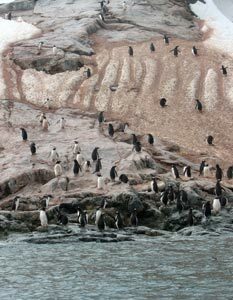 However, there was no time to sleep in - the ship was abuzz with the anticipation of our first landing - on Hut Island, a small islet in the Harbour containing a small hut once used as a research base and a colony of gentoo penguins. 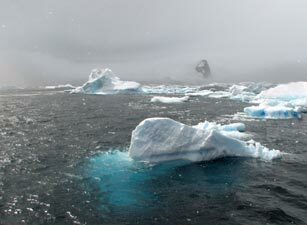 Looking out from the boat, we could see the moving black spots of the penguins on the snow, while in the background, the ice cliffs of Trinity blended into the Antarctic fog. 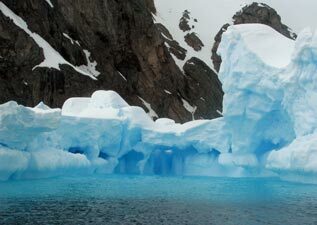 Soon we were attired in our warmest clothes and full wet weather gear; the side door of the ship opened out to a small landing platform and we clambered into the waiting zodiacs for the short trip across the choppy water and bobbing ice fragments to the island. 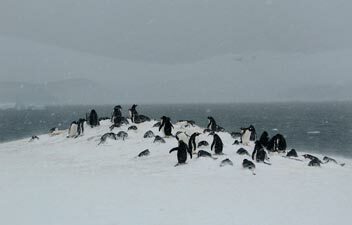 It was good to be on terra firma, though in the soft deep snow that had fallen overnight it was more terra than firma. 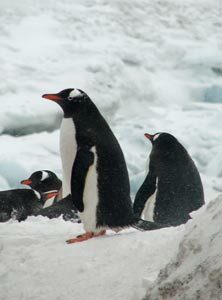 The gentoos stood or lay about in small clusters, some half-covered in drifting snow, others waddling about to check out the strange intruders. 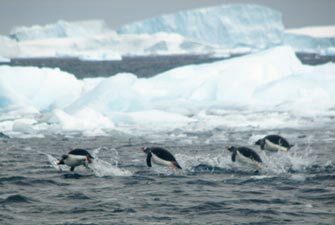 Others took to the water, demonstrating their mastery of this element as they flashed through and over the water with impressive leaps, or just simply took a bath with a great deal of splashing. 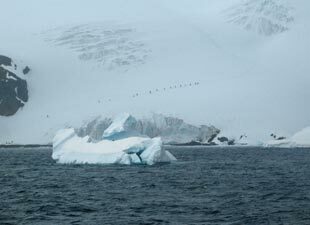 Above, the odd skua hovered above the penguin colony, while a pair of snowy sheathbills sat almost invisible on the snow in their white plumage. 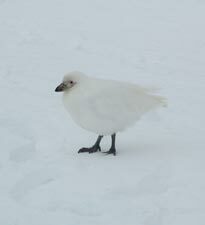 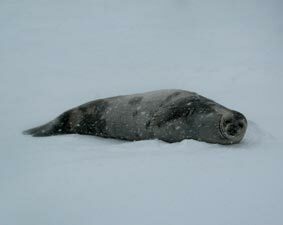 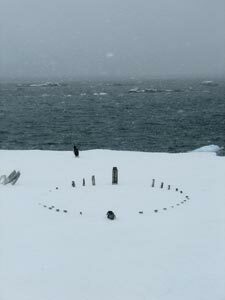 As we wandered slowly around the island, taking in the bleak beauty about us, it began to snow again. 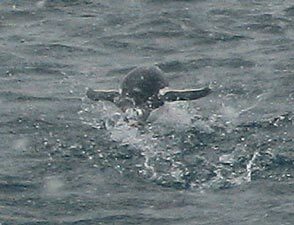 We slowly circumnavigated the island, passing a pair of crab-eater seals that had hauled out and which barely deigned us with a passing glance. 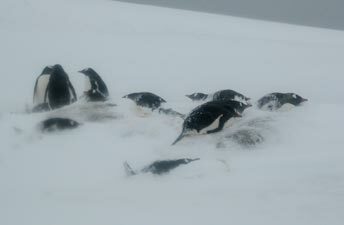 After an hour on shore, the snow gradually got heavier, the penguins began to huddle up and it was time to return to the ship. 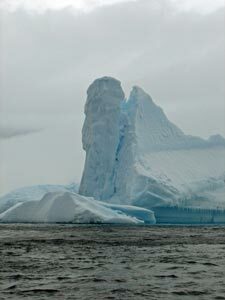 When all were back on board, we pulled anchor and set sail for Cierva Cove another 20 nautical miles to the south. 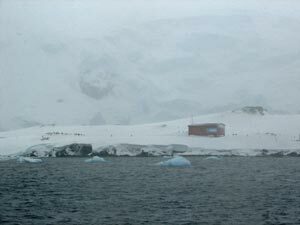 This would be our first landing on the continent of Antarctica. 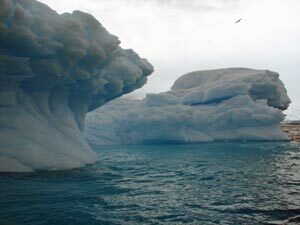 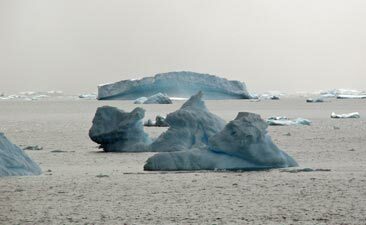 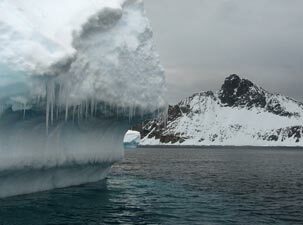 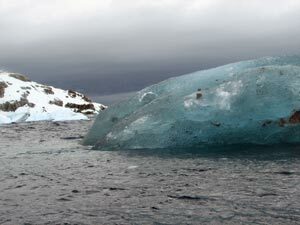 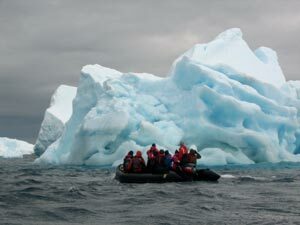 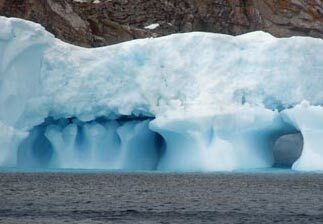 The entry to Cierva Cove was spectacular; the snow had stopped falling and the sun broke out in parts to illuminate a feerique world of floating ice of all sizes, from tiny fragments to large wind and wave sculpted blocks to enormous tabular icebergs. 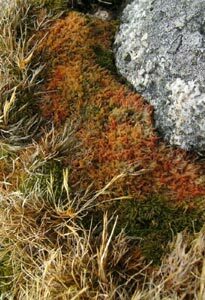 Some appeared brilliantly white, others gleamed blue and others appeared a dull cream or pale grey as the light above changed. 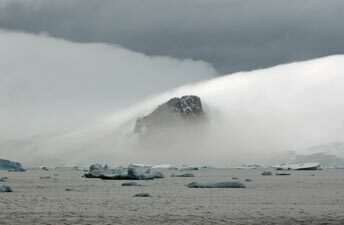 Behind them the glacier-lined mountains of the peninsula rose steeply, framed by a dark and glowering sky. 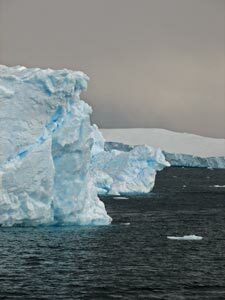 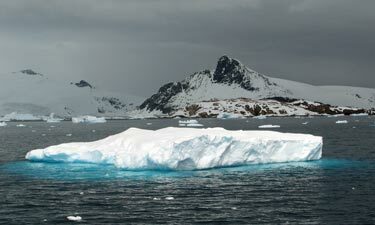 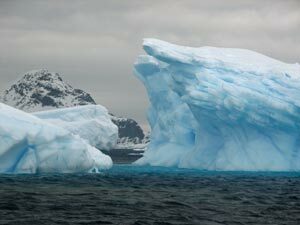 The ridgeline of Cierva Cove - continental Antarctica at last! 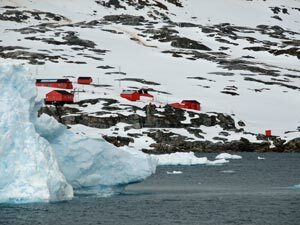 After lunch we boarded the zodiacs once again and picked our way through the sea-ice and bergy bits to reach the landing to the bright red huts of Primavera - an Argentine research station, still closed for the winter. 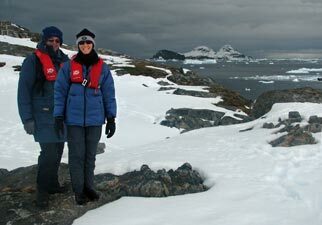 We had finally landed on the Antarctic Peninsula and stood on the rocks of our seventh continent! 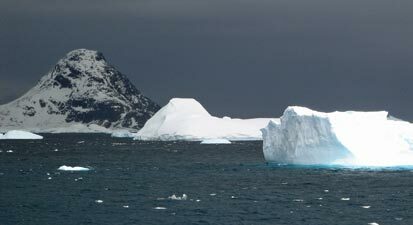 As we looked out across the iceberg dotted waters to our floating home, dwarfed by the snow and ice covered mountains behind it, the immensity and isolation of this part of the world struck home. 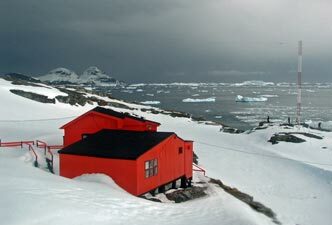 Finally, the seventh and last continent! 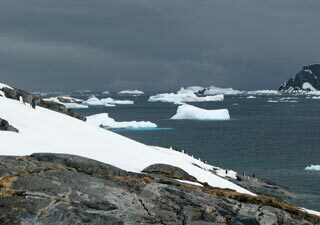 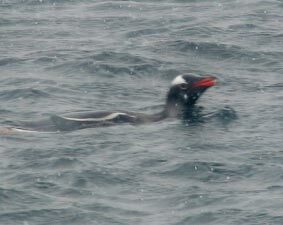 To the right of the station was another large gentoo penguin colony, while bright green mosses and small grass tussocks clung to the rocky knobs above the deep snow. 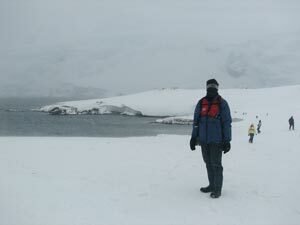 This was an Antarctic climax plant community. 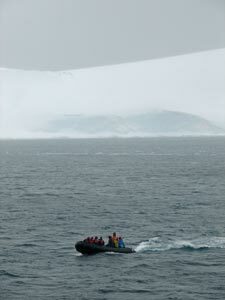 The sun had disappeared, but visibility was still good and, after visiting the base, we climbed back into the zodiacs and, escorted by leaping squadrons of gentoos, slowly wended our way amongst the diversity of icebergs; their surfaces sun-dimpled and etched by waves, some sculpted into bizaare shapes, others forming pale blue grottos, others massive chiseled walls of opaque white ice covered with a thick layered blanket of snow, and yet others gleaming translucent blocks filled with bits of rock and grit. 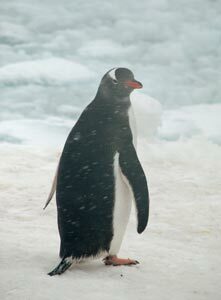 It was magical! 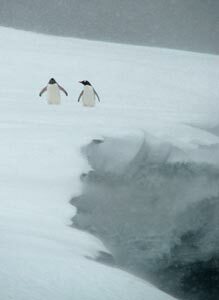 Our return to the ship was none too soon. 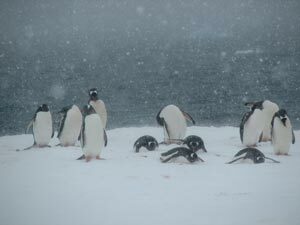 The skiing party had barely returned from their brief foray up to the ridge when the cloud descended and it started to rain. 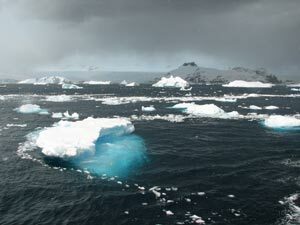 As the temperature dropped sharply, the rain turned to sleet and, as we set sail once again, a full blown snow-storm set in with thick flakes driving horizontally across the ship. 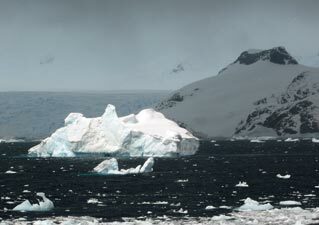 We had been fortunate in having a break in the weather at Cierva Cove, but now it was time for a lesson in the changeability and severity of the Antarctic weather. 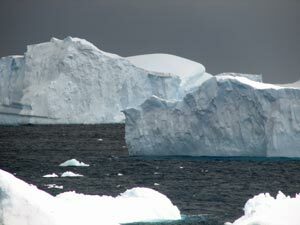 However, I must confess that we felt a bit like we were cheating, as we sat in our comfortable lounge chairs, drinking G and Ts, eating warm food and watching the blizzard through the double-thickness glass of the Ocean Nova's observation deck.